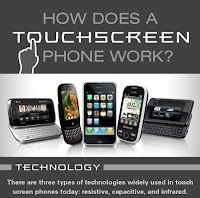 Touch screen concept has transformed many mobile phones, laptops into geeky gadgets.Many doesn't know that there are different technologies behind this touch screen.For those who want to know about types of touch screen, differences between them and which one to choose, following details will help. 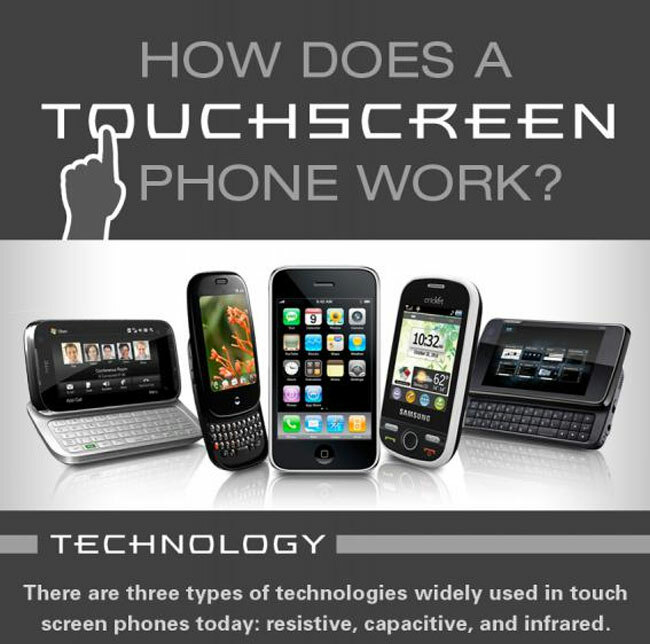 In brief, there are 3 types of touch screen technologies available in market. Physical pressure need to be applied. Responds only when touched with some sort of conductive materials. Technology used in Huawei Ascend,Sanyo Zio,Apple's iPhone,HTC Hero,DROID Eris,Palm Pre,Blackberry Storm phones. Heat Sensitive must be touched with a warm object. Optical uses sensors to shoot a grid of invisible beams just above the screen. Technology used in Samsung U600(heat), Neonode N2 (optical) phones. Source of this information is from following images.